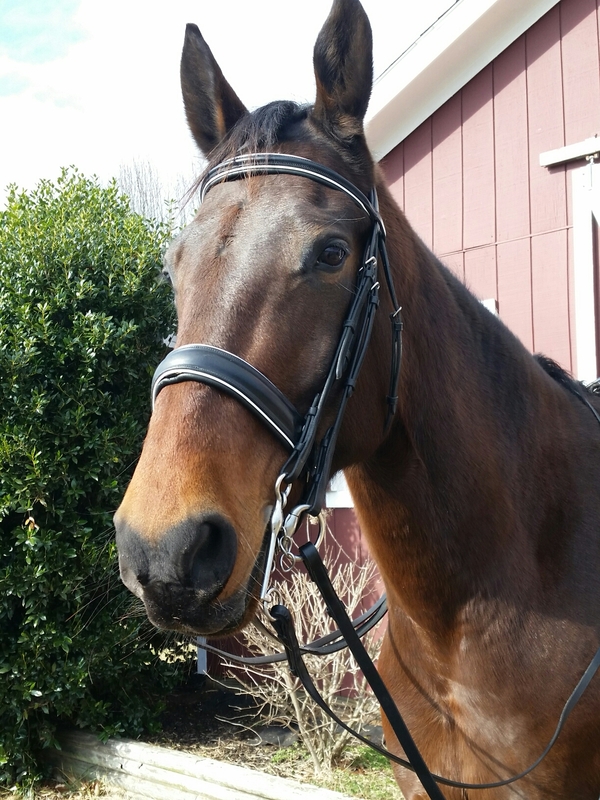 When Mom does ride, she puts the big boy bridle on me. I am not a fan of all the extra metal in my mouth. I like to play with all the pieces. Sometimes I get it under my tongue which forces Mom or Ms. C to have to fix it. Mom thinks it gives her more control, but I proved otherwise a couple of days ago. She was trying to slow me down, but I managed to set a pretty fast pace. Mom results to yelling, “slow down!! !” but I just ignore her. A boy has to have some fun once in a while. We are working on stuff to move up to Third Level this year. Mom wants a medal of some sort and the stuff I am learning will help her get it. I wonder what it tastes like. Will it get me more treats? I had better get an Uncle Jimmy ball if she gets her medal. We have been lucky this winter that the snow has not piled up and we have not had weeks of sustained cold. I like it since it means Mom can’t keep me in a blanket all the time. I look silly being the only horse at the barn whose mother dresses them in ridiculous clothes. I guess I should be glad that the goofy patterns don’t come in my size. You see your friend’s number pop up on your cell phone, and when you answer, you know what the call is about even before a complete sentence is spoken. The tears stream down your face as they surely are on your friend’s. They said goodbye to their beloved horse that morning. There is nothing more to say at that moment. You share a moment of silence and say goodbye. What is it about these amazing creatures that make their loss so hard even when the horse is not yours? It matters not the horse’s age or what that horse did or did not do during its life. Pedigrees become just words on a page; ribbons lose their shine. All that matters is that your friend loved their horse and now the horse is gone. They loved their horse even when there was no ribbon from the show. They loved their horse even when another mystery wound appeared on the leg. They loved their horse as they sat in a cold barn into the wee hours of the night as the horse recovered from colic. They saw past any flaws and just saw love in those big brown, trusting eyes. As their friend, you wish you had some profound words to help ease the grief. You wish a hug could stop the tears. Time appears to stand still for days on end. A card never seems to say enough. I would give up every year end award for them to have one more day/week/month or year with their four-legged family member. The loss makes you realize that each day you have together is a gift. Hug your horses tight, tell them you love them each and every day, and never forget to be there for each other.